When I stepped onto the deck this morning to dump some tables scraps into the compost bucket, the small indention on to of the pail had collected a small reservoir of rainwater on the lid. After the front moved through last night, the temps dropped like the stock market. 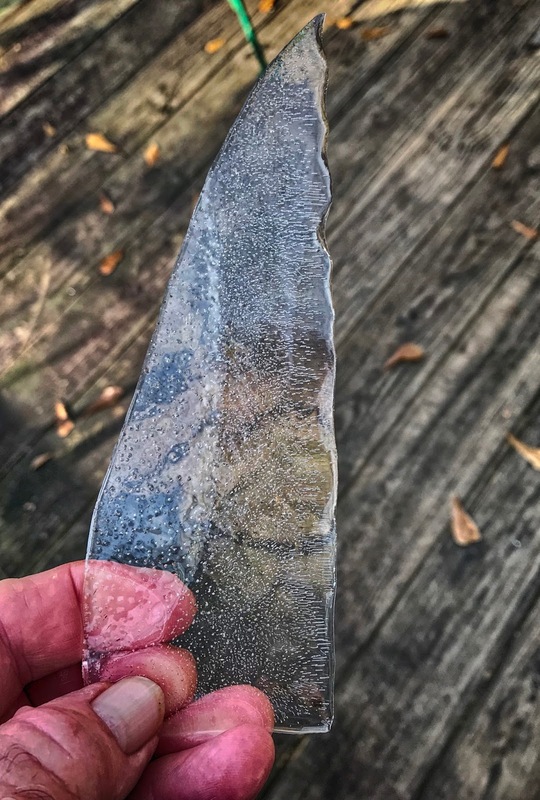 The colder temps turned the water into a thin sheet of ice. I opened the lid and dropped the scraps and let the lid close on its own. The impact broke the sheet and a blade of ice landed on the edge of the bucket. Picking it up, the natural design inside the ice blade was intricate. You can't see it from this picture so you'll have to take my word that it was incredible. Pulling the phone from my pocket, I snapped a photo. I just wish it could have captured Mother Nature's handiwork. I can see it was there. Even if I couldn't actually see the patterns. And it only took one night to create it. That's pretty cool! Mother Nature has her abilities but she's bringing us more snow and cold and I'm betting lots of ice too! Hope your weekend is good! Thanks for teaching us to notice! I first thought that the ice blade was a kitchen knife blade. That is so cool. Nothing can surpass Mother Matures work of art. You cannot beat nature's art work for sure. It's is everywhere and sometimes we miss it because we don't take the time to look. Seems to me you are pretty observant ! Yep Mother nature is very crafty. HOWEVER I didn't need to see ice in Alabama! ;-). We feel the chill even down here!